At Mangalmay we not only teach text books but also give practical knowledge of the corporate world. The industry academia interface helps the students to succeed in all walks of life. InnovationM Technology Solutions Pvt. Ltd.
✓ NAAC Accredited & ISO 9001:2000 Certified Institute. ✓ Online Certification courses from more than 10 Foreign Universities for meritorious students. ✓ TCS Certified Computer Labs. Mangalmay Group of Institutions, Welcomes The team of India's Got Talent at Campus. 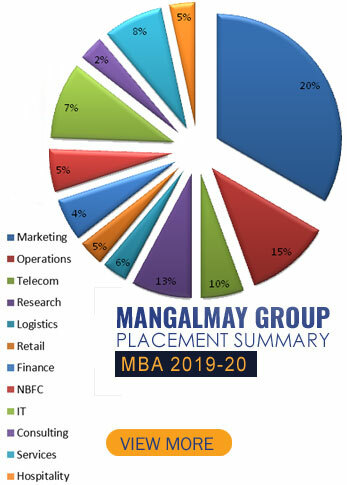 Established in 2002, Mangalmay Group of Institutions is one of the premier NAAC accredited Institution with a prime focus on Innovation, Excellence and Nurturing global leaders for a sustainable future. We incorporate Knowledge, Industry experience, Research, and International exposure in our curriculum, to offer comprehensive educational program to the students. The post graduate and graduate programmes offered at Mangalmay are affiliated to AKTU, Lucknow (formally known as U.P.Technical University) and approved by the All India Council for Technical Education (AICTE) Ministry of HRD, New Delhi. Institute is also affiliated to C.C.S University Meerut. Our vision is to disseminate knowledge in the field of Management, Engineering, Bio-Technology, Commerce and Education. Driven by creativity and curiosity, Mangalmay strive to provide an educationally outstanding experience for students. Mangalmay has been ranked among the best MBA and B.Tech college in Delhi NCR. Mangalmay Institute of Engineering and Technology has evolved as one of the best B.Tech college with global reputation that strives for high quality education. The mission of the group is to offer innovative opportunities to our students to showcase their creativity and talent thereby making positive impact on the society. In the record time of 18 years, Mangalmay Institute of Management and Technology (MIMT) has earned a distinct position for itself and been ranked as the best MBA college in Delhi NCR. MBA admissions are based on merit basis. Shri. Atul Mangal, Chairman, Mangalmay Institute of Management & Technology is a dynamic leader who believes in inculcating a culture of innovation and imparting quality education for students. He believes in fostering whole-person Integral growth of students. Shri. Anuj Mangal, Vice Chairman, Mangalmay Institute of Management & Technology is an enthusiastic icon believes in providing excellent academic delivery and infrastructure to his students. He believes in offering great opportunities for all round development of students. There is a strong focus on research and development of faculty members from different stream. We also offers cross-organizational collaboration and liaises with different business communities. Awarded Innovative Placement Leader 2018 by Integrated Chamber of Commerce & Industry in National Educational Excellence Conclave. Awarded Best Institute for outstanding placement record in Delhi NCR by Her Excellency Smt. Mridula Sinha, Hon'ble Governor of Goa, 2017. Awarded CCLA Indian Education Leadership award 2017. Awarded Top Private B-School by Digital Learning ranking 2017. Awarded Business School of the year by the Academic Insights. Ranked 15th for Engineering by Amar Ujala & IMRB International Education Survey. Ranked 'A' in Best B-Schools of India by Business India. Ranked 16th in Delhi-NCR by Mail Today (India Today Group). Ranked 5th for Management by Amar Ujala and IMRB International Education Survey. For Management by Amar Ujala and IMRB Intl. Edu. Survey. Life at Mangalmay was as experience like no other and I can proudly vouch for being associated for over 2 years with this Institution. The overall exposure which one receives here is in-comparable, which by default teaches lessons which are learnt way beyond the classrooms. After 2 years of learning, all the skills and knowledge that I have acquired being a student of MANGALMAY made me confident and I was ready to face every challenge of the world. When I look back now, I think I have made it…I stand at this vestibule of success and pride for which I and my teachers worked so hard! Thank you to all the respected Mentors at MANGALMAY. Mr. Aaron Paul Cipla Ltd.